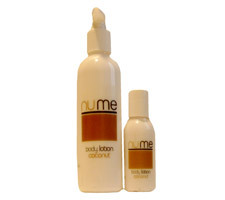 Nume is a range of preparations that encapsulate and deliver a slice of paradise to you. Coconut reigns supreme throughout the range and with its natural minerals and anti-oxidant qualities you are sure to be able to comfort minor irritations, nourish, hydrate and beautify the hair and skin. Introduce fragrance by organic oils from exotic tropical flora such as; Frangipani or Feijoa/Papaya and you have an enticing, irresistible concoction of skin and body treatments that will calm and relax the mind whilst rejuvenating the spirit. 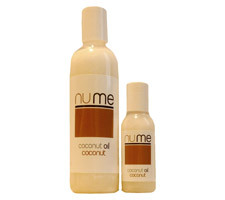 At Nume we have focused on the pure and natural safe guarding the vital essence of our preparations by ensuring that the method of production is safe, efficient and heat free, thereby preventing damage to the minerals within the oil. Pure virgin coconut oil can only be successfully obtained through a cold press method. While the products are suitable for the vast majority of skin conditions we recommend that more serious conditions or concerns should be referred to a Doctor or Skin Specialist prior to receiving a treatment or applying at home. Nume is a sincere range and many beauty establishments and clients are already enjoying the benefits that we invite you to experience. Healthy, Revived Skin, Soft, Shiny Hair with a Calmness and Tranquillity of Mind. Pure indulgence in a pot, Nume Body Butter is the ultimate treatment for dry, flaky and devitalised skins. 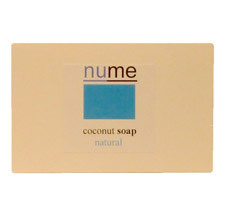 Our range of coconut soaps are made with the highest quality ingredients. Coconut soaps have a light, fluffy lather that leaves your skin feeling soft and fresh while looking balanced and healthy. Cold pressed virgin coconut oil is the safest, most effective, highly nutritious skin treatment available.